Despite large industrial base, it is matter of concern for any self respecting Indian that we are dependent on imports of the defence equipment to the extent up to 70%. 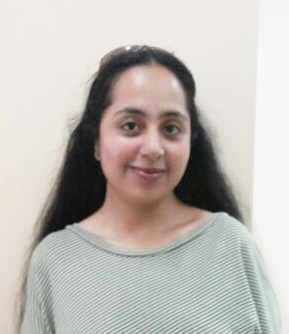 The author examines the reasons and some recommends possible way forward. Indian defence industrial base has been the exclusive preserve of the state and have been the primary source of indigenous development and production of defence equipment. Regrettably, despite substantial national investments in capacity building, partnering and licence production agreements with foreign OEMs, imports at 70% continue to dominate induction of equipment. We need to deliberate, why is it that nations combat equipment profile and state is not contemporary? Why is it that we are still importing practically all types of weapons and systems, fighter aircraft, armoured vehicles, radars, missiles, naval vessels, almost up to 70% of its defence requirement? Despite large industrial base and a huge captive defence market, why we have not been able to enhance domestic production capabilities? Is it due to rules of engagement in defence production? An immediate concern for India's armaments strategy is to strike a balance in the holding and the problem of replacement of obsolescent major weapon systems. Fig depicts the scale of obsolescence that prevails today within the armed forces. With such equipment state with the three defence services, the modernization of the defence force is lagging behind by about 15 years. A presentation on state of equipment to the Parliament's Standing Committee on defence in Dec 09 highlighted the Army's preparedness in key areas, like armoured corps 71 per cent, combat helicopters 17 per cent, mechanised infantry 62 per cent and 52 per cent in artillery. In air defence systems the preparedness was 44 per cent, 60 per cent in engineers, infantry 65 per cent, special forces 69 per cent and in Net centricity 24 per cent. 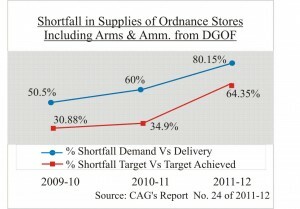 The worrisome state of the operational preparedness of the Indian Army has not improved even as of now. Similar is the case when it comes to Indian Air Force and Indian Navy which are anticipated to have more than half of their inventory reaching obsolescence. India is currently the 9th largest defence spender in the world with an estimated 3% share of global defence expenditure and the world's largest importer of arms between 2007- 12 accounting for 12 per cent of global arms imports. Despite a push to develop domestic weapon platforms, India is still heavily dependent on the foreign suppliers with about 65-70% arms/ equiments still being imported from abroad. This in turn has made the indigenous capability gap to remain a cause of concern, dspite substantial investments in the defence public sector units. 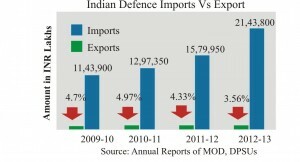 The defence imports by the country have been increasing over the year in all segments of major platforms. Figs below refers. missiles, frigates, submarines, aircraft and electronic devices. Barring few in which they achieved limited success such as Pinaka, naval warships, missile development like Shourya and Sagarika missiles, etc, there is nothing much to seek credit. The indigenous capability gap is a cause of concern, emphasising the attention and address the issues by the new Government on priority. Major indigenous projects to design and manufacture have taken years to mature due to lack of technology resulting in delays and cost over-runs. For instance, the Main Battle Tank (Arjun) and the Light Combat Aircraft (Tejas) projects besides others, to quote a few, have consumed huge resources and taken decades to develop. Some other programmes that are seen or have been facing time and cost overruns include as depicted in the table. PDC has been further extended within the sanctioned cost and scope. Major equipment and weapon systems including aircrafts, armaments etc. are being imported. Most of the major on-going Aero Platforms such as Intermediate Jet Trainer, Cheetal Light Helicopter, Advanced Light Helicopter Mk-IV, Light Utility Helicopter, Light Combat Helicopter, LCA are facing delays and huge cost escalation. The major Land and Naval Systems are in the same boat. 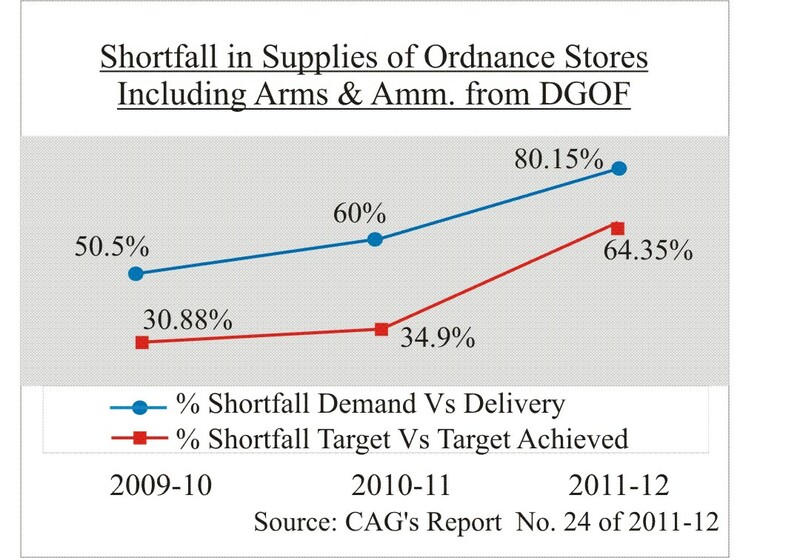 India, Ordnance Factories have been lagging behind in their production programme for ammunition, weapons and vehicles, materials and components (refer table). These figures, though, reflect the overall position; however it can be inferred that the targets have not been achieved even in respect of production of arms & ammunition. 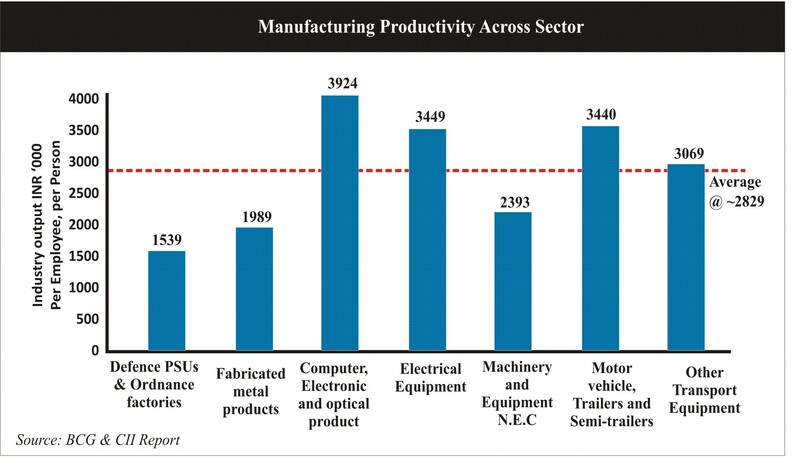 The productivity per employee of India's DPSUs and OFs, which employ over two lakh persons, remains to be much lower than the average across all sectors (Fig.) which speaks of the culture and practices followed by most of the public sector units. Incidentally the overall value addition of DPSUs hover around 37%. In case of OFs the value addition is substantial (85%), possibly because of the lesser technology depth of land systems compared to fighters and frigates and sourcing being done from sister companies. Even amongst the naval platforms, value addition in submarines is substantially less (23%) compared to patrolling vessels (37%), because of technology depth. In general, the initial process for capital acquisition as per DPP is executed under the overall guidance of the DAC. Its decision as approved by the Defence Minister will flow down for implementation. The DPP specifies the timeline for any procurement of Rs 300 cr or less including the signing of contract is 92 weeks and over Rs 300 cr due to offset obligations is 137 weeks. However, in majority of the cases the time taken is much beyond the stipulated time and in worst cases it has taken decades to finalize a contract. 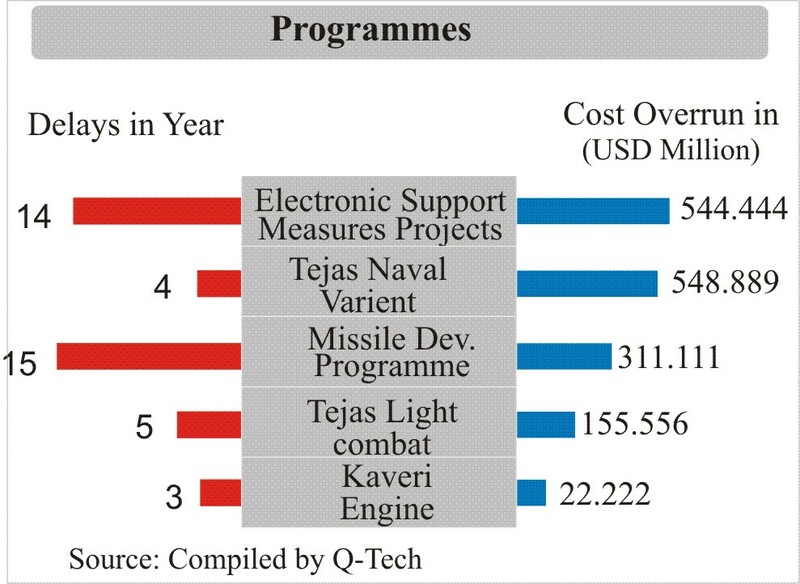 Indian defence procurement is famous for long delays in the procurement programmes. Table depicts the three case studies which implicate this: Till now not a single project has met even the maximum 150 weeks (almost 3 years) time line. Slippages have become common feature of the procurement processes, for example, Field Artillery Rationalisation plan 1999 envisaged the $5-7 billion procurement of 3,000-3,200 assorted calibre howitzers by 2027. None of these acquisitions have even taken off. These delays have very serious fallouts like, huge escalation in price, Operational ramifications, Kickbacks, technologies becoming obsolete etc. Many of the programmes have gone through numerous changes in due course of time and number of them has seen multiple re-tendering. Most of the major procurements have got stuck in the bureaucratic tangle. Though, in some of the cases MoD may have valid reasons to hold the process of procurement, however, in number of cases, delay could have been avoided, if the concerned authorities, at various stages, had followed the timeline. Most of the procurement proposals are languishing through the labyrinthine procurement procedures. The procurement of 126 French Rafale fighter jets, 22 Apache attack choppers and 15 heavy-lift choppers, as well as artillery, UAVs/drones and Electronic Warfare (EW) Systems is outstanding. On top of it austerity measures, depreciation of value of rupee, policy uncertainty and reluctance for foreign investments, mounting 90 to 95 percent committed liabilities, not leaving much for new projects. The capital expenditure is hit by any decline in the rupee. Since capital expenditure, including instalments for equipment bought during previous years, is denominated in foreign currency, any fall in the rupee upends the calculations.Today, companies are reluctant in participating in the programmes as they don't want to bid in any never ending programme owing to the fact that the contracts are being cancelled/ delayed for many of the deals even after the bids have been finally selected. In January 2012, when Rafale was declared the winner, its price was quoted between $60-65 million (Rs373-Rs400 crore). However, since last two years the negotiations have been going on between the vendor and the MoD with the deal yet to be inked. This delay in inking the deal has resulted in escalation in cost of the fighter jet made by Dassault which is expected to now cost $120 million (Rs746 crore) each. This is due to falling Indian rupee and increase in price of systems/sub-systems of the aircraft every year. The price hike would mean that the deal would cost India nothing less than $28-30 billion (Rs1.75 lakh crore-Rs1.86 lakh crore) which earlier in 2008 when the RFP for the same was issued was quoted to cost $10.2 Billion. As the negotiations continue, the cost is spiraling out of hand. India had originally negotiated the price of the Gorshkov at $947 million and the deal was signed in 2004 with Russia but the delay in acquiring it made Russia push the price up to $2.9 billion. In early 2008, Russia claimed it underestimated the scale and the cost of the modernization and said it would not be in a position to deliver the ship before 2012. It also demanded an additional cost of $1.2 billion. After a round of renegotiations the price that India is now paying is $2.3 billion instead of the $2.9 billion demanded by the Russians. As a result, the Indian Navy's objective of inducting a second-hand foreign aircraft carrier was not met in time to fill the gap in its capabilities. The most substantial increase in Gorshkov's cost of $522.57 million was on account of sea trials, which were originally contracted for $27 million. This has increased by almost 20 times to $550 million, creating doubts about the diligence exercised while estimating and negotiating costs. The export market size and share reflects the sustainability and competitive edge of an industry. 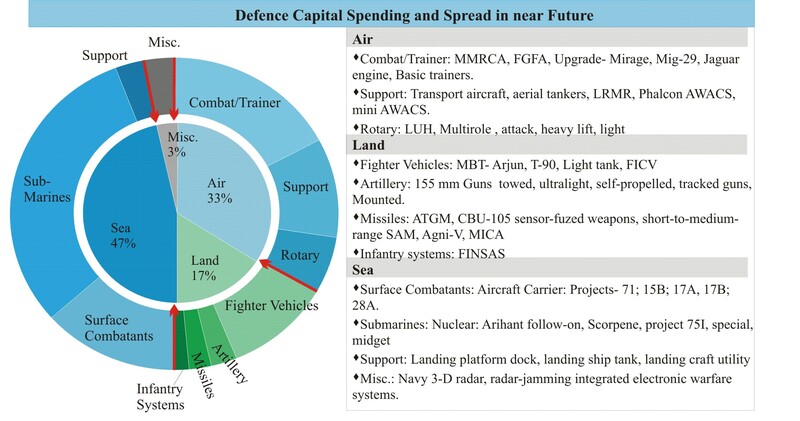 The defence industry has not fared well on this count due to quality of product offered, marketing strategy, lack of technology, competitive pricing, and the existence of a negative list of countries where the export of defence equipment cannot be explored, the large number of clearances required. Even with an assured order to the tune of INR 200 billion every year, manufacturing organizations, which have the capabilities to ramp up, have not made a dent in the export market and also failed to stop imports. 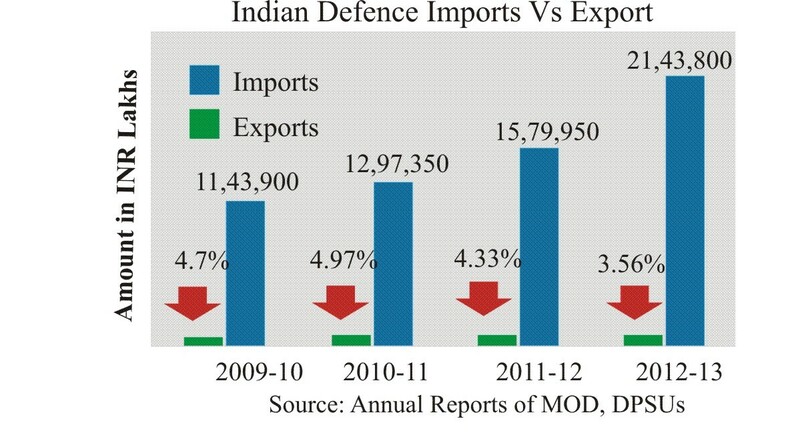 The impediments for defence exports need to be removed. The infrastructure in Ordnance Factories and some of the DPSUs which has been built over the years needs continuous updating, in order to remain contemporary with the advancements, by induction of state-of-art technologies. According to figures provided by the MoD to the Standing Committee on Defence, the OFB will spend Rs 15,764 crore on modernization during the 12th Plan (2012-17). During the 11th Plan (2007-2012) the OFB spent Rs 2,953 crore on modernization and capacity augmentation. As far as DPSUs are concerned, between 2009 and 2013, Rs 3990 crores have been spent to modernize 9 DPSUs, while an additional Rs 6820 crores have been spent for R&D efforts by DPSUs alone. In the 12th Five Year Plan period (2012-2017), the outlay for modernization of DPSUs is Rs 14,726 Crores. There is also a dire need to impart skill to the manpower. The government made fundamental changes in the IDR Act in 1991 and the defence sector was opened to private sector participation. As a result of this, the private sector can now manufacture defence equipment after obtaining a government license. 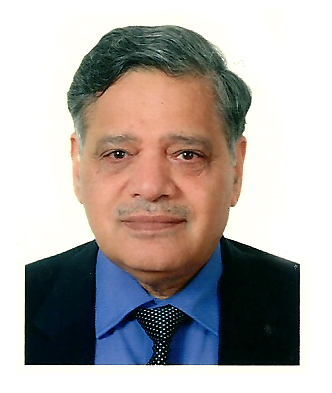 However, the constraints faced by private industries in defence and aerospace industry are multiple as they require an industrial licence, complex regulatory compliances, restrictions on domestic sales and export, intricate taxation hurdles, caps on foreign direct investment, and evolving defence procurement procedure which does not provide a level playing field, continues to favour nomination over competition with no guarantee of firm orders, economies of scale and even business consolidation. 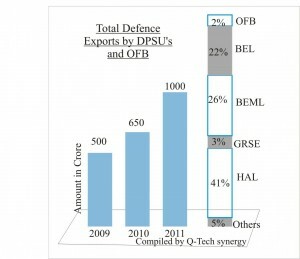 Earlier about 5200 companies were supplying around 20-25% of components and sub-assemblies to state-owned base in the defence sector. Many large industries have shown definite inclinations to assume the role of system integrators by investing both in R&D and infrastructure to develop capabilities in defence production. The industrial houses like L&T, The Tata group, Ashok Leyland, Pipavav Defence and the Mahindra Group have already made their presence felt in the Indian Defence sector and are set for further expansions. So far, over 200 Industrial Licences/Letters of Intent have been issued to various companies in the private sector for manufacture of a wide range of defence items. The emerging dynamism of the private sector in India increases the opportunities to obtain advanced technologies from foreign sources. Various partnerships and collaborations across the industry have tried to engage in defence production. Some of the top MNC have set up design centers which provide designs produced indigenously. However, the private industry has not been able to contribute to its potential in the absence of a level playing field. The objectives can be attained with a funding support as an incentive to promote the Indian aerospace and defence industry and develop a domestic manufacturing base, encourage entrepreneurship and promote research & development. Support creation of manufacturing infrastructure through Public Private Partnership (PPP) between OFB/DPSU, the Indian Private Sector and foreign OEMs, including formation of consortia to address specific programmes necessary to build national capacity. The Indian Navy's ATV Model suitably modified could work for the IAF AVRO project and even the IN NMRH project. From a competitive perspective total acquisition cost is higher in case of Indian vendors when compared to global OEMs. The exemptions, available to other core sectors, if made applicable to the defence and aerospace sector could provide a fair and reasonable incentive for building national capacity in this vital sector. State level benefits: Provision of concessional duties and state/local tax exemptions, supply of public utilities at concessional cost, subsidies for Capital Expenditure, stipend for trainees etc. As per para 1.4.8 of Appendix F to Part III of RFP of DPP 2013 exchange rate variation shall be applicable for INR contracts with Indian vendors for Buy Global categories of acquisition and shall not be applicable for Buy Indian contracts except for DPSUs in ab-initio single vendor cases where DPSUs have been nominated. Not providing the Exchange Rate Variation (ERV) would leave prospective Indian private defense industry bidders at a disadvantage with respect to foreign bidders and the Defense Public Sector Units (DPSUs)/Ordnance Factory Boards. The Government of India has already moved to apply the Exchange Rate Variation (ERV) clause in Government & Public Sector procurements, applicable to projects that have duration of 18 months or more. The 'Manual on Policies and Procedures for purchase of Goods' allows bidders to quote an appropriate exchange rate to mitigate impact of component price escalation. Under this clause the bidder has to specify the import content and the currencies used for calculating the value of import content in their total quoted price, which will be in INR. Applying the ERV clause, which already exists as law promulgated by Government of India, pari-passu for MoD contracts will benefit both the MoD who would know for certain the import content in the product and protect the Indian industry from exchange risk. Hence, the same provision should be applicable to defence contracts also and included in para 1.4.8 of Appendix F to Part III of RFP. For Buy Indian contracts Indian bidders can only bid in INR. However, Government of India guidelines has authorized, Indian bidders to bid in any currency and receive amounts in such currencies as in the case of foreign bidders where the Indian agency has certified the project as one in which foreign companies/entities are invited to bid for Government projects. In these cases where such bids providing for payment in foreign currency are accepted from Indian bidders, it will be necessary for the Indian agency inviting the bid to make payment in foreign currency to the Indian bidders as also the Indian bidder to receive payment in foreign currency from the Indian agency. Reserve Bank has accordingly granted general permission vide its Notification No.FERA.l25/93-RB dated l5th January 1993, issued under Section 8(l) of FERA 1973, to persons resident in India to incur liability in foreign exchange and to make or to receive payments in foreign exchange in respect of global bids where the Central Government has authorised bidding procedure enabling Indian as well as foreign companies/entities to bid for the supply of goods and services for projects to be executed in India. Since the import content of defence products can be as high as 50%, exchange rate variation can be a major risk particularly for long duration projects. Hence including such an option at Para 1.2.2 of Appendix F to Part III of RFP would provide a level playing field for Indian industry. The DPP 2013 does not provide a price variation clause. However, the General Financial Rules, 2005 and various other procurement manuals of the Indian Railways, Department of Atomic Energy etc where projects run into several years have a price variation clause. Capital procurements by the MoD also take several years to fructify and complete. Bidders are required to submit a firm and fixed price for defence capital procurements which is not rational since predicting such long term trends of labour and material costs can be disastrous. Under Rule 204 (viii)(a) of GFR(2005) where a price variation clause is provided, the price agreed upon should specify the base level viz, the month and year to which the price is linked, to enable variations being calculated with reference to the price levels prevailing in that month and year. A formula for calculation of the price variations is also included at Appendix 15 of the GFR 2005 for guidance where the variations are calculated by using indices published by Governments or Chambers of Commerce periodically. Defence contracts are usually long term contracts and asking vendors to quote fixed and firm prices for projects running into several years is unfair. Since the provision for price variation already exists in government guidelines the same must also be made applicable to defence contracts. This could be included as new para 1.4.9 of Appendix F to Part III of RFP of DPP 2013. The Discounted Cash Flow method is applicable to determine the Net Present Value of stage payments. The methodology for the same is contained at Para 2 of Appendix G to Part IV of RFP of DPP 2013. The method prescribes models for tenders received in the same currency and tenders/bids received in different currency. The crux of the problem is in the determination of the applicable discount rate for bids in different currencies. Globally the norm is that each currency should be discounted at its own risk free interest rate. However as per the DPP 2013 both Indian and Foreign currency bids (after conversion, basis the spot rate of the date of opening of the price bid, to the INR equivalent) are discounted at the Government of India's lending rate on loans to state governments. This is extremely disadvantageous to Indian bidders since the interest rate differential in risk free interest rates across currencies maybe as much as 10 times the Indian Government of India's lending rate. In the specific case of US$ bids the risk free interest rate for discounting maybe only 1.5% but the INR rate is as much as 6-8% and in a situation where the Indian bidder equals the foreign bidder on the total price the Indian vendor would still lose on NPV basis. This is also true for bids in different currency bids for Buy Global acquisitions including possibly the MMRCA for which the L1 vendor has been determined by using the NPV method. For detail please refer to article by Cmde. Sujeet Samaddar in this issue page no. 21. Since the subject matter of energising the national defence industrial base involves interactions and dialogues with multifarious agencies as stakeholders building a 'robust indigenous defence industrial base” is a tall order for MoD to execute and be responsible for by themselves. 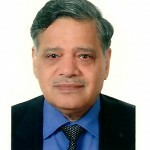 The issues and contradictions between the ITC(HS), NIC Codes, SCOMET List, various press notes of DIPP, Formation of JVs and FTCAs, and in addition various matters of direct tax and indirect taxes such as Customs, Excise and other taxes and Offset stipulations, requires a larger inter-ministerial discussions. To truly galvanise the defence industrial base the MoD could seek a formal Inter departmental consultation to comprehensively address the required incentives, benefits and exemptions to energise the national defence industrial complex. As regards incentives the foremost requirements is to create a favourable, transparent, credible and firm policy and regulatory framework which creates a single window system to address all matters of defence licensing, imports and exports, offsets, domestic sales, etc. Similarly, incentives for local innovation in aerospace and defence R&D and manufacturing by way of national awards and recognition, funding support for mission mode national projects etc could be considered. Creating world class indigenous defence production capabilities would not be possible without major structural changes within the Ministry of Defence. The Department of Defence Production is only looking after DPSUs and OFB besides some other functions. The sense of ownership at times goes against the overall national interest and provides a false sense of security to the otherwise capable Public sector in Defence production to compete on its own merit. India has to overcome the hesitant, piece-meal and turf-led approach to defence industrialization and take appropriate measures. In the present context it should be restructured as “Department of Defence Industrial Facilitation” or say Deptt of Defence Industry Development from MOD department's agencies like DGQA, DGAQA etc. Re-engineer organisations and processes by merging or dynamically linking departments in charge of acquisitions, production, indigenisation, R&D, ToT, manufacturing and exports - to create synchronised entities focusing on promoting indigenous high technology. The organization should facilitate the Private sector as well in Defence Production in the same way as it does now and provide facilities on testing /evaluation and other issues. The present FDI cap of 26% is not attractive for both Indian and Foreign OEMs owing to the fact that the Indian OEMs carry the higher risk of venture capital and the foreign OEM on the other hand carry the higher risk of IP rights for his proprietary products so for both it is not fruitful. However, the Defence Ministry is still reluctant to increase the FDI limit from 26 to 49 per cent for defence sector. There is no doubt there are different views on FDI, depending who is seeing what aspect from which angle but the crux of the matter is the alleged apprehension that FDI in the aerospace and defence sector is hollow of security hazard. It is unfortunate that we purchase the main platform from Foreign OEM without any production or maintenance facility but cannot permit them to have manufacturing base. We also tend to ignore the fact that all assembly and integration, testing and delivery of systems manufactured in India by a foreign OEM will require local industrial support the moot point is that it will also spawn a satellite of SMEs feeding the national defence industrial complex. This would create the larger ecosystem for a successful defence industrial complex. It is quite simple to comprehend that greater security is achieved if equipment is manufactured in India even by a foreign OEM than through reliance on imports. The sad state of affairs in the Indian aerospace sector is that even a simple trainer aircraft or a transport aircraft have to be imported into India and that is not only a security risk but a matter of national shame. The experience of other countries such as Brazil has the Embraer(earlier a 100% govt Company and then with partnering with Alenia/Aeromachhi has now become the 4rth largest aircraft manufacturer) and Helibras with Eurocopter success story are the fine examples. The foreign OEMs investment for setting up manufacturing facilities in country provides greater security. Some of the Foreign Majors have their own 100% subsidiary based in India. Incidentally in the Public Sector, Government has approved Joint Ventures with FDI in excess of the stipulated 26%. BrahMos is a 50:50 JV, HAL/BAe is a 50:50 JV, HAL: RR is a 50:50 JV, FGFA is a 50:50 JV and these are successful ventures. However the so called provision to approve higher investment depending on the nature of technology to be transferred has never been approved for Private Sector; especially given the unwillingness of existing suppliers to share key technologies. Indeed, accessing technology will be the biggest challenge for the development of indigenous defence manufacturing. 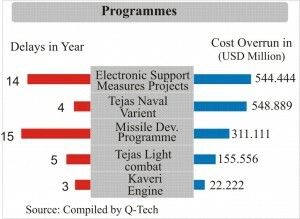 Therefore, in view of the foregoing a forward looking FDI policy in this sector must address the core issues of both absolute and relative limits of investment, what that investment does towards building Indian capability and capacity and how that investment impacts the defence technology base of the country. Experience from the automobile, petrochemical and infrastructure sector show that FDI does bring in technology, creates jobs and most importantly spawns robust SME suppliers. Contrarily the liberal FDI policy in the Telecom sector has not spawned a manufacturing base but has brought in major improvements and efficiencies in the services segment of this sector. Technology transfer primarily comprises knowledge including the “know-why” and “know-how” of developing a certain class of equipment. Sanctions are difficult to apply on this knowledge once it has been transferred and not surprisingly the US exercises a great degree of caution. This should add weight to the preference for technology transfer rather than outright purchase, provided that the recipient has requisite manufacturing facilities. The government-owned entities have been having the advantage of recipients of Maintenance Transfer of Technology (MToT) from foreign vendors in major acquisitions. In all deals where transfer of technology is negotiated, the nominated recipient is always a DPSU, even if a private sector company is better placed in terms of infrastructure and know-how to absorb the technology. Offsets have made an impact on Indian industry but it is mostly at the sub-contracting level for goods and mostly services. 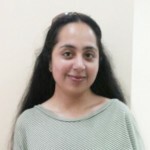 The main point is no OEM would subcontract to an Indian vendor unless there is confidence in quality, schedule and costs. So the basket of opportunities remains only those few low skill manually intensive items such as harnesses and connectors, racks and displays, missile containers etc. To avoid duties and taxes, the foreign OEMS have to import subsystems and component. Under 'deemed exports', the Indian industry offering offsets would become more competitive by getting export benefits in taxes and duties. Government should think of creating a specific Export facilitation agency under Secretary - Defence Production and active participation from Industry chambers. This agency (visible in case of many export focused nations including most advanced economies) should be empowered to monitor the actual progress of Defence exports with respect to planned targets and to initiate mid-course corrections as may be required by the policy. Further mandate DA's in Indian Embassy's overseas to facilitate interactions with target country establishments in order to convert major export opportunities in to orders for the Indian companies. Parameters for the equipment to be procured are formulated with foreign equipment in mind, after reading manufacturers' brochures. Private sector is not consulted in this process, whereas minor acceptable changes in parameters may make the Indian equipment eligible for consideration. Although having the best systems and equipments constituted of the best of the materials and technologies is desirable, it might not be practical and feasible. Therefore, SQRs should be in conformity with the actual requirements of the services. SHQs should only define top level capability/performance requirements from systems and leave industry to find the solution using the appropriate technology. Requirements of the armed forces are not made known to the private sector sufficiently in advance, with the result that it does not get adequate time, either to scout for foreign tie-ups or to establish the necessary facilities. The time given for the submission of technical and commercial proposals is grossly inadequate for a new entrant in the field. RFP should entail the concepts like “throughout life support” or from “womb to tomb.” There should be provision for upgradation and assigned agency should not withdraw after delivering Mk 1. It is also easier for the industry to export the lower version of any sophisticated equipment or system. The DRDO needs to focus on developing critical cutting edge technologies. The non critical technologies development should be left to the Industrial Base. Government should involve the IITs, research and development institutions IIMs, IISC in undertaking defence R&D and promulgate approved list of academic, research and development institutions where industry may tap for research and technical advice. The TPCRs do not provide relevant information for industry. It does not include the brief description of the product, the technology drivers, the alternatives, the quantities needed and the timelines. The armed forces are in the process of undertaking major modernization programmes. Over the next decade or so, the three services would be undertaking significant procurements. Indian defence spending has been hovering between 1.7- 2% of GDP in recent years with the lowest being 1.74 in the current fiscal. The defence budget is projected to grow by 10% to over Rs 275000 crores by 2016-17 (end of 12th 5 year Defence Plan) and cross Rs 635000 crores by the end of 14th 5 year Defence Plan (2026-27). Refer Fig. Defence sector in India had been a restricted sector under the exclusive control of the government dominated by Department of Defence Production. The combined production of DPSU and OFB in 2013 stands at approx Rs. 45000 crores. Most of it is produced for Revenue and part for Capital procurement. The total procurement (Capital plus Revenue stores) presently being to the tune of 133000 crores, the DPSU /OFB share is about 33-34% of the total procurement. The DPSU/OFB supplied products also include what these agencies procure as component or subsystems from Foreign OEMs and Indian Private Sector. Out of the 33-34% of procurement that comes from the domestic sources, 21 per cent is procured from state-owned production agencies and 9 per cent is procured directly from the private sector. (SIPRI Report 2012). Thus, even if we consider a conservative ratio of 33 percent as expenditure on indigenous production and domestic market size of approximately $ 4.77 bn (Rs 23,850 crore) in 2011-12. Considering the domestic market would grow to $ 15.7 bn by 2022 and to $ 30 bn by 2027, the % share of indigenous source would improve to over 40% and 50% respectively. With such a conservative estimate the import contents will go down from 70% to 50% and the indigenous contents will increase to reach at 50%, as shown in Fig. Building India's neo modern aerospace and defence sector to meet the challenges of timely acquisition of platforms, systems and equipment through Indian companies requires a multi-pronged inter-ministerial intervention. Energizing DIB require Government's on-going active management and fine tuning of policy, regulations, process and fiscal environment to ensure the growth of strong Indigenous Defence Industrial Base. The industry is a stakeholder in defence production. Government should chalk out a strategy in consultation with Industry organisations to promote indigenous design, development and manufacture. With adequate policy measures will strengthen the overall supply chain from component manufacturers to system integrators. The Govt needs to make conscious efforts for a paradigm shift from the 'Buyer-Seller' relationship to that of a healthy 'Partnership' between the industry, the Armed Forces, the DPSUs and the DRDO-perhaps a consortium approach. Today the private sector is capable of supporting each segment of the process, be it research, be it components, be it sub-assemblies, major assemblies, maintenance and support, spare parts or even complete products. Self-reliance has no alternative. A country like India cannot indefinitely depend on foreign suppliers for majority of our equipment. 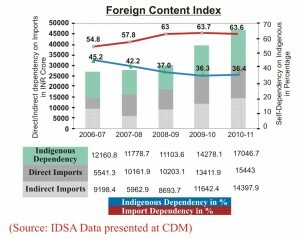 We need to reverse the present trend of 70 per cent import to 70 percent indigenous. Great website, thanks a lot ! !